Thanks for your interest in my Great Great Grandfather, J C Derby. He is buried in the Glen Cove section of the cemetery, along with his wife, a child that died in infancy, his brother and his brother’s daughter that died as a child. 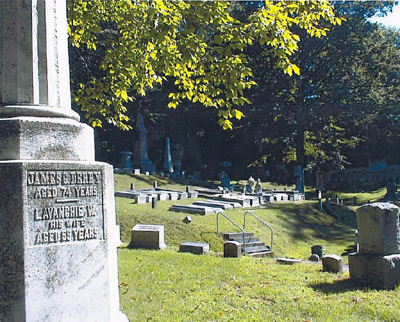 It is overlooking the Glenn Haven section where his “life long friend” (as stated in his book, Fifty Years among Authors and Publishers) William H Seward is buried. I am attaching a photo of his grave overlooking the Seward graves taken by us in 2005. Derby, James, Cephas, publisher, was born in Little Falls, NY July 20, 1818, eldest some of Benjamin and Lezetta Derby. He was educated in the public schools of Herkimer, NY. When fifteen years old he was apprenticed to Henry Ivison, a bookseller in Auburn, NY who took him in his own family to live. He rapidly developed as a salesman and an authority on literature. In 1840 he formed a partnership with a son of Mr. Ivison, and the firm of J. C. Derby & Co. commenced business as publishers and booksellers. Their first book bearing their imprint was published in 1844 and was entitled "Conference Hymns with Tunes, Adapted to Religious Meetings for Prayer." In 1848 Mr. Ivison withdrew and Norman C. Miller, a former clerk, became partner and the firm was known as Derby & Miller. James C. Derby was also one of the members of the first Board of Trustees of the Cemetery along with: Enos. T. Throop Martin, Thomas Y. How, Jr., William C. Beardsley, Zebina M. Mason, Michael S. Myers, John H. Chedell, Nelson Beardsley, Benjamin F. Hall, John W. Haight, Cyrus C. Dennis, and Issac S. Allen.